The Victorian Turkish Bathhouse Theme gets Updated! COMMON AREAS: The stairwell has been hacked with gno's 2-way hack allowing multiple sims to use the stairs at one time; The Advert posters and Skylight pieces have been updated to prevent flickering in UL+ games when a Sim walks behind them (No or Low EP games will need to use the old files to keep the objects semi-transparent); The Hottub has been fixed so outgoing kids choose a simsuit anyway. ALL FILES: All objects were also tidied up a bit: Unused thumbnails were removed (reducing the set by 3MB!! ), a real thumbnail was added to each object, and the objects are now categorized for all lot types. If this causes trouble in your game, remember to de-categorize them appropriately before playing. THE LOT itself has also been re-uploaded as one of the gender doors was originally installed backward. This change only effects people using the newly updated gender-doors and, of course, there is no need to re-download the lot if you have been using it already - just remember to flip the door 'round yourself. GUID CONFLICTS!! Caretaker Bunny has recloned a few items with GUID conflicts and uploaded them in place of the original files. Each of these newly cloned files has had the suffix "_idfix" added to it's filename so it is easily identified, BUT it wont over-write the old file automatically. You'll need to remove the old file from your Downloads folder yourself. A quick list of all of the replacements can be found here. OF SPECIAL NOTE: One of Bunny Wuffle's house, The Midlantic House (Lot 3, also had to be replaced with a freshly saved copy of the lot that has the newly cloned roof piece in place. The house zip and the big zip have been replaced so if you've had any trouble with that house, please re-download it is see if this doesn't fix the problem for you. These are "new" files are dated 2006 and 2007, but are only becoming available now in 2015. Please do not take objects from Architectural Supplies as they are to use on your site. However, if you have a free site or immediate-access Yahoo group, I am very happy indeed for you to take and recolour / retexture / redesign my original objects, and indeed, actively encourage you to do so. You don't need to ask me, just go ahead and have fun. 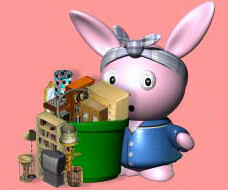 The only thing I ask is that you provide credit to Bunny Wuffles and a link to Architectural Supplies both on your site and in the object description. If you have a pay site; a site / group / forum where registration or donation is required before gaining access to the objects or a Yahoo group that requires access to be granted manually by the owner, I need you to ask me FIRST please. Other than that, clone away! And let me know the location so I can download the items too! 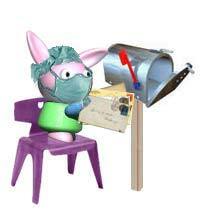 Look out for Little Artist Wuffles starting to appear throughout my site telling you full details about the cloning terms on the objects or sets you can download from here. She replaces the Recolourer's Resource Project, which because of the continually changing terms and availability of participating sites proved to be too much for one bunny to maintain. Many of the items on this site are cloned from other people's work. Where I have had specific permission for an item to be cloned, you will need to ask the same permissions from the original designer and what kind of credit they require. Items like this are clearly marked on the download page and Little Artist Wuffles is starting to clearly identify them too. Want to link to Architectural Supplies? You will need all expansion packs up to & including Superstar installed on your computer to use items found on Architectural Supplies For Sims. Unfortunately, I cannot even advise on the suitability of individual objects because different expansion packs retrofitted many previous default Maxis objects to suit the new gameplay. There is a detailed explanation to this phenomenon in the relaunched "Downloading Without Tears" section in the Housekeeping Station. You may have all the expansion packs I have - and even more if you have Makin' Magic installed - yet when you install one of my houses, you still get the "missing objects" message. Why would this be? I have tried to explain this in my relaunched "Downloading Without Tears" section, where you will find other hints and tips for safe downloading. People have been telling me that I am sending them virii. And it's true. They are receiving virii laden EMails from my old addresses. Do you know what I did the other day? I EMailed a virus to myself. Why did I do such a thing? Honestly, I couldn't tell you because I don't remember doing it. But I did indeed send that virus. It says so right there in the EMail, FROM:BunnyWuffles. So I must be the one that sent it, right? Don't be so sure. It used to be that if someone emailed a virus to you, you emailed them back and reported them to their ISP for their foolishness. Today you can't do that. Since the onset of the Klez virus a few years ago, virii have been wreaking chaos around the world by spoofing the email addresses it sends itself from. In plain English that means that rather than mail itself out using the address of the person infected (as it used to do), it now takes a random name from the infected person's address book and mails itself out as that person. And if that isn't all..... There are web-bots that scan forum or web-pages for EMail addresses or links. Those addresses are then used for spoof emails to send out viruses and spam mail. So these days, nearly all email virii spread by automatically mailing themselves out to everyone in any address book it gets a hold of. Some can even "look" online for email address links to use in the same way. All of which makes it impossible to figure out which infected person's machine sent that EMail to you. BE ASSURED that if you receive an EMail from me with an attachment that I haven't told you on a forum or elsewhere that it was arriving, that EMail is NOT from me and no doubt contains a virus. Don't open it, don't send it back to me - just delete it! How can you avoid becoming infected with such a virus? First, never ever ever open an attachment received via email if you didn't know it was coming. If you think it might be a genuine mail, put the email in question into a separate folder, then email the person back and ask them what it is. But don't forget the above - you are as likely to receive an email virus from someone you do know as you are from someone you don't know. Second, get a good, updated anti-virus program and scan everything you download before you run it. Some EMail clients scan your incoming and outgoing mail automatically - Yahoo for one, but this doesn't include things you download from outside your EMail environment. If you can't afford to buy a program such as Norton or McAfee, there are some excellent free ones out there, such as AVG Anti Virus from Grisoft. The Norton and McAfee sites also have free downloads from time to time to help you detect and remove virii and other nasties so they are well worth a visit in any event. Additionally, N99 (starlightsims.yuku.com) is sharing a few older things in the Sims1 File-Share section which may not be at the groups. There may be even more. Be sure to do a search! 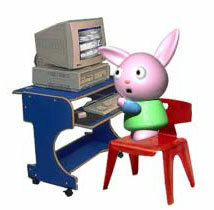 Strategy Planet has opted to stop hosting Sims sites webpages, so Bunny Wuffles has moved and is now sharing server space at Woobsha.com. They are still hosting the zip files so all of the same instructions for downloading apply. I thought that last time with my two new tutorials I had concluded the "Progressive Tutorials" series. Then I realised there were a couple of things I hadn't addressed. So here we go again, this time dealing with Animated objects, our first look together at the XML file, and first steps in using Photoshop Actions and Automation. Don't think you missed out on a set when I talk about a sofa & chair in one of the tutorials - that will be my next set due out very soon now. I will also be shortly releasing a set of ready-to-play tutorial objects for those who want the large window and other items without having to learn Moggery. If you have ever considered making your own objects for The Sims, do please take a look at my Progressive Tutorials. They contain all my knowledge of TMog and Photoshop (where relevant) and have all been tested on people with no prior knowledge of either (waves at long-suffering family). It's been a long time coming back and most people won't need this anymore. But I did it anyway because I'm like that. Yes, the Housekeeping section is now more or less complete, but beware of the bugs! (only kidding, they're harmless really). Meet Chambermaid Wuffles and Secretary Wuffles, both ready to give you advice on such topics as file organising, object corruptions and many other things in the way of troubleshooting our game when things go wrong - or helping to prevent things going wrong in the first place. No new downloads but two new tutorials, concluding the "Progressive Tutorials" series. If you have ever considered making your own objects for The Sims, do please take a look at my Progressive Tutorials. They contain all my knowledge of TMog and Photoshop (where relevant) and have all been tested on people with no prior knowledge of either (waves at long-suffering family). The Sims object plug-ins you find here have been made with the utmost care, and the instructions given for downloading and installation to your game are as accurate as possible. Ultimately though, as with any fansite, you are downloading and using these items at your own risk and neither the webmaster nor other people involved in bringing you Architectural Supplies can be held responsible for any game or computer problems which may arise from the use thereof. Please note that we cannot take any responsibility for the content of Web pages found through links on this site which are provided solely for information. These links do not imply an endorsement of these organizations by myself, my web hosts, or any other site linked to here. Content on this website remains the intellectual property of Architectural Supplies For Sims.Game content and materials copyright Electronic Arts Inc. Maxis, "The Sims", EA and related images are registered trademarks & are the property of Maxis™ and Electronic Arts Inc™. This Fan Site and its content is not endorsed or approved by EA.